“…My fans have been asking for a Christmas album for years, telling me my voice would be perfect for these songs. Everyone had their favorite songs that they wanted me to include, so we tried to get in as many as possible. I’m really proud of the way it turned out. Christmas is one of my favorite times of the year and it’s really fun to be able to share it with my fans in this way…” With his smash hit single “Hope In Front Of Me” winning listeners over with the relatable themes and heartfelt lyrics, pop/worship singer/songwriter Danny Gokey (who previously competed and sung on American Idol) released his sophomore album Hope In Front Of Me in 2014, to immense critical and commercial acclaim and success. So what’s a musician to do after a stellar and exquisite effort leaving him the talk of many? Well in the case of Danny, who hails from Milwaukee, Wisconsin, and is a former church music director; it’s time to be immersed in the spirit of Christmas and celebrate the birth of Jesus, with the new album Christmas Is Here! What is remarkable about Danny’s story is that his journey to become a singer/songwriter started with the urging of his first wife Sophia, who passed away just before he came to auditions at American Idol. Since then audiences have connected with the raw, honest music, and now Danny’s profile is on the rise due to his step of faith when he was at his lowest point in his life. With many songs on his second album (his first album in CCM) being a testimony of God’s goodness and faithfulness and the fact that Jesus keeps his promises; this 3rdplace finalist in the 8th season of the A.I. holds nothing back in the holiday seasonal offering! With both well-known carols and original melodies coming together for an inspiring and powerful batch of ten tracks, these melodies are what we all can listen to as we worship Jesus and reflect upon His birth. Probably one of my favourite Christmas albums this year, this album is one for fans of artists like Mark Schultz, Jonathan Thulin or Phil Stacey. Opening the track list with the jazz/dance infused trumpet led 2 minute lesser known carol “What Christmas Means To Me”. With rowdy crowds and a celebratory atmosphere, this mainstream holiday song, though not having any reference to Jesus, is a happy and cheerful tune to put us in the holiday spirit, as Danny eloquently and passionately declares what Christmas means to him, that it’s ‘…candles burnin’ low, lots of mistletoe, lots of snow and ice, everywhere we go, choirs singin’ carols, right outside my door, all these things and more, that’s what Christmas means to me my love…’. Expressing joy and wonder at the little details that make up Christmas, the added gospel choir brings authenticity, and invokes a sense of looking deeper, as we are posed the question as well, of what Christmas really means to us. Danny’s faith lies in Jesus, so everything that’s mentioned in this song is what Christmas means to Danny, but it also means Jesus’ birth, so we need to take stock and ask that same question too! Kudos Danny for a heartfelt and thought provoking opener! The remainder ‘holiday’ melodies are “The Most Wonderful Time Of The Year”, “This Christmas (Hang On The Mistletoe)”, “White Christmas” and “The Christmas Song”. Though these catchy tracks don’t explicitly mention Jesus, they do have their place in the months of November and December, as we are bombarded with ‘reasons’ as to why Christmas is great, and are encouraged to look into these reasons to see if they hold any merit or not, and to see whether there is more to Christmas than what society advertises it to be. Driven by synth and vibrant keys, the orchestral 2 minute “The Most Wonderful Time Of The Year” features Danny’s strong vocals against a chilling backdrop of an enthusiastic gospel choir, as he relays that the most wonderful time of the year is when ‘…there’ll be parties for hosting, marshmallows for toasting and caroling out in the snow, there’ll be scary ghost stories and tales of the glories of Christmases long, long ago…’; while the 50’s and 60’s inspired piano jazz infused “White Christmas” shows Danny ardently outlining to a friend and/or loved one that he wishes their Christmas to be enjoyable, significant and a joy to experience, that ‘…may your days be merry and bright, and may all your Christmases be white…’. “This Christmas” isn’t a song I’m that familiar with, and though I originally thought Danny covered a TobyMac song, nevertheless this inspiring melody reiterates the importance of family and relationships with loved ones during the holiday season, as Danny fervently sings out that during Christmas we can ‘…hang all the mistletoe and I’m gonna get to know you better, this Christmas, and as we trim the tree, how much fun it’s gonna be together, this Christmas…’. And though there have been many renditions of the iconic Nat King Cole covered “The Christmas Song”, ranging from Francesca Battistelli, Whitney Houston, and Demi Lovato, to Newsboys, Michael Buble, Idina Menzel and Amy Grant; there’s something about Danny’s soft, reflective piano piece that tugs and pulls and my heartstrings and emotions. In this rendition, Danny’s vocals are sublime, as he emotionally and majestically sings about turkey, mistletoe and Santa. Though that’s a far cry from about Jesus’ birth, hopefully non-Christians can take a look at Danny’s discography if they enjoy this song, and be drawn to his songs glorifying Jesus- and that season alone is enough for me to be proud of and congratulate Danny’s effort in these ‘mainstream’ songs! “O Holy Night” and “Mary Did You Know” bring the focus back to worship, as Danny eloquently imparts that Christmas should be a time of praising Jesus because of everything He’s done for us. In the piano focused sow worship ballad, Danny executes one of my favourite renditions ever of one of my favourite Christmas carols, as this emotional, heartfelt melody invokes feelings of gratitude and thanks to God for giving us hope and salvation in the form of Jesus as a boy born in a manger. As Danny cries out for us to ‘…fall on your knees, O hear the angel voices, O night divine, O night when Christ was born…’, we are presented with a worship experience like no other, and an anthem that is timeless and surely will be timeless in the next 50 years and beyond! Apart from Kutless’ version, which I feel is sometimes over featured on compilation albums, as well as the more recent worship rendition of Meredith Andrews, I haven’t heard much versions of “Mary, Did You Know”. Yet it is Danny’s rousing piano led offering that impacts me the most, and is a great addition, as we are treated to a soft ballad that turns into an epic orchestral gospel choir infused melody that is literally out of this world, as Danny reiterates and provides inspiration that with Jesus in our lives, ‘…the blind will see, the deaf will hear, the dead will live again, the lame will leap, the dumb will speak the praises of The Lamb…’. What am amazing proclamation to sing over us, right? While the original reggae and Caribbean flavoured title track adding further musical diversity and variety, with Danny emphatically highlighting that Christmas is a time to be celebrated, whether we are living in the northern hemisphere with snow, or in the southern hemisphere with sunshine; it is the lead single “Lift Up Your Eyes” and the album closer “Give Me Jesus” (yes, they hymn!) that impact me the most! Driven by electronics and catchy synth, Danny’s enthusiasm cannot be denied in “Lift Up Your Eyes”, an original song where he passionately reiterates the fact that we can give God worship and glory because of Jesus’ birth. One of my favourite songs on the album, the lyrical simplicity may be seen as a hindrance but I don’t see it that way, as it highlights Danny’s superb voice, as well as the impacting lyrics pointing out that we can ‘…hear the angels song break the silent night, lift up your eyes, lift up your eyes, see the saving One, born that none may die, lift up your eyes, lift up your eyes…’. While the sublime gospel influenced piano prominent well known hymn and album closer “Give Me Jesus” is the perfect way to end a worshipful album- despite the anthem not being a Christmas song, Danny’s offering reassures us that Jesus is all we need at the end of the day, that ‘…in the morning, when I rise…when I am alone…when I come to die…give me Jesus…’. With such emotion, vulnerability and honesty, if there’s one song that I would recommend from this album, it would be this one! Well done Danny for the perfect mix of mainstream holiday songs, Christ centred carols and original recordings. While not necessarily as breathtaking as MercyMe’s Mercy Me, It’s Christmas!, or as grandiose and epic as Chris Tomlin’s Adore, or worshipful as Paul Baloche’s Christmas Offerings Volume 2; Danny Gokey’s new Christmas album is nevertheless great for listeners who are longing for a theme of hope in their lives and reassurance that Jesus is with us right at this moment. An album that’s certain to be a best seller in both Christian and mainstream holiday markets, Danny’s album is sure to be on my iTunes playlist during this Christmas season and beyond! 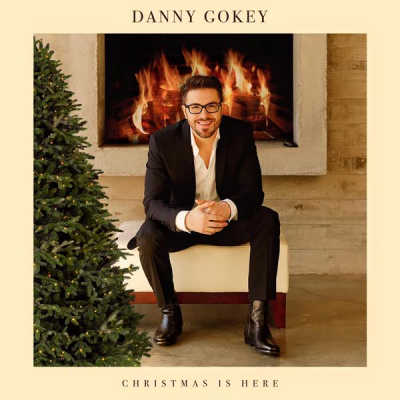 Well done Danny for such a poignant, powerful and prolific Christmas album, and one of my favourite CCM/country artists since Jason Crabb.